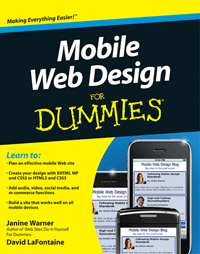 Get a password for the Mobile Web Design For Dummies Bonus Section. What is the last word in the caption for Figure 2-1 (the first figure in Chapter 2) in Mobile Web Design For Dummies? Please enter your user name and password for the Mobile Web Design For Dummies bonus section.